Area 68 A. 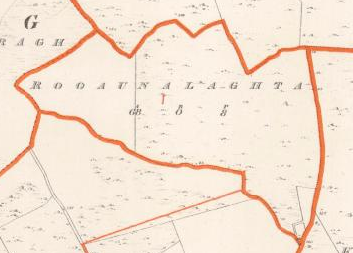 0 R. 8 P.
Ruadhán na Leachta , the reddish land of the monument. There is a monument here. S. by Toorard td. ; and W. by Carrowoughteragh td. It contains 68a. Or. 8p., and is the property of Thomas Reddington, Esq., of near Galway. It is all held by Michael Kelly, under a lease, as a stock farm. Rent not ascertained. The soil is a light, sandy clay, with a great deal of limestone.